Let's not beat about the bush... the author is one who walks his own path, ever deepening his (and our) understanding within the occidental tradition. Taking the time to attend a Catholic or Orthodox mass (on a number of occasions) will deepen an understanding of the writings of the author. 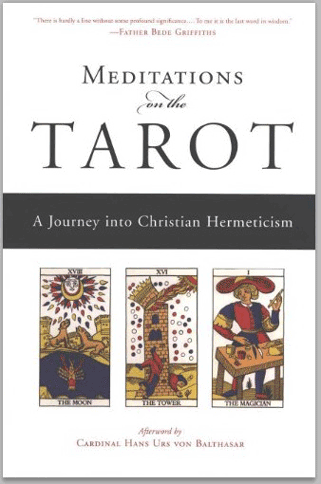 a copy of the book Meditations on the Tarot. A copy of the deck used by the author is also recommended: the Ancien Tarot de Marseille (France Cartes edition). Over the course of three years, discussions on each letter of this book took place, allowing two sessions per letter, as well as summary sessions between the years. This was followed with two consecutive one-year courses. In 2013, on the first Saturdays of each month (except January) and the ensuing Mondays; in 2014 having longer 'double' sessions on the Saturdays, each session covering one letter. Over the course of 2015 and 2016, we again met on the first Saturdays of each month (except for January), between 4 and 7 pm, each session covering one letter. 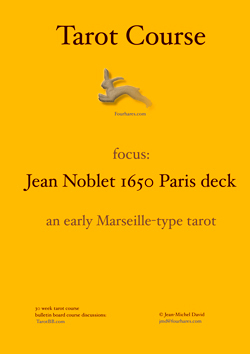 The book assumes that you will obtain a copy of the Jean Noblet Tarot (though images are produced within the book). The deck is available directly from Roxanne Flornoy (located in France) and from Tarotgarden (located in the USA). Please mention my name and fourhares.com when obtaining your deck (I do not get any funds from this, just a little kudos). 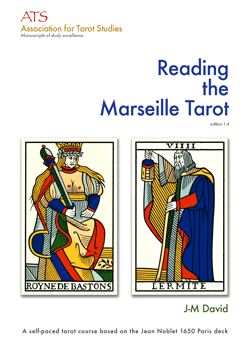 Reading the Marseille Tarot is based on this former online course (with some necessary minor adjustments). Please note that I do not plan to offer this course any longer as it is essentially covered in the book. Past participant feedback is shown to the right and below. C4 between March and December 2010. I have completed the 30 weeks’ course of Tarot Studies with Jean-Michel David in 2008 and found each encounter both enriching and inspiring. My knowledge of Tarot history and the multiple aspects of each card was greatly increased and the sessions of readings inspired me to practise reading cards for both myself and some of my friends. JMD's 30 week TDM course has been a surprising and satisfying journey into the TdM and the Tarot in general. In 6 short pages every week, JMD's chapters are like fertilizer to anyone wanting to grow their understanding and expand their skills with these fascinating cards. The ideas presented are offered with outside links creating the opportunity for a chain reaction of study that continues as far as the student chooses to go. A week was not always enough to follow a card. It covers history, philosophy, art, tantalizing educated speculation and opens a window into the minds of the TdM's creators. The exercises provided many challenges that have opened new ways of seeing the cards. Play is encouraged and patterns and conversations between the cards or even within a single card, depending on the context, were very revealing and creatively stimulating. The amount of information and direction was just enough and suited me even when my attention span was, for what ever reason, shortened. I found the course (interrupted by some travel) well worth while. It did not help me read with a TDM, but it solidified how I feel about Tarot, and historical cards. I explored new ideas in contemplating images, learned new areas of interest, re- read some books with a new eye, and became more structured in how I approach Tarot History. These things are invaluable. 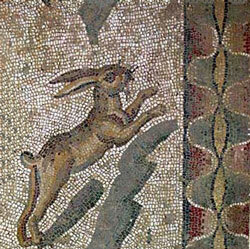 I used the jmd's discussions/chapters on a trip around Italy, and it enriched that adventure. I knew what I was looking for, for starters. Perhaps not oddly, but what I learned in the course about reading the cards, I applied to non historical decks with excellent success for my inner eye. I value education highly, and the educator in jmd is obvious and skillful. One of the attitudes that I found great, was the spacing or organising of subjects each week. There was for me a structured UN- flow, so I wove through the deck without losing interest. 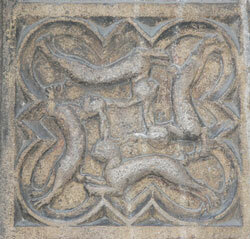 For example- Alchemy before Temperance and the Devil was structured- but did not feel that way. Very clever! I have been reading Tarot 30 yrs. I have taken several Tarot courses from some of the most respected Tarot folks teaching today. JMDs course ranks up there with the very best. It is well worth the time & effort. 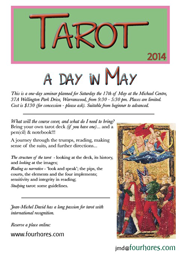 Its not easy to choose appropriate adjectives to describe Jean Michel David's "30 Weeks of Tarot" course... 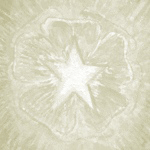 It's one of a kind experience, an enjoyable and fulfilling journey of learning and self discovery through Major Arcanum of Tarot de Marseilles. Prior to signing up for this course I thought I'd never make it, I wished all this TdM "craze" would simply go away, but in only thirty weeks Ii changed my mind and became a "TdM convert" with the accompanying the conversion zest and verve! Just got to the end of the course. While I realised early on that it wasn't exactly what I was looking or, I enjoyed the few exercises and I will keep the Pdf files as they are a goldmine of historical information. I would recommend anyone to participate because even if it's not exactly what's expected, at some point in the future it may be just what's needed.